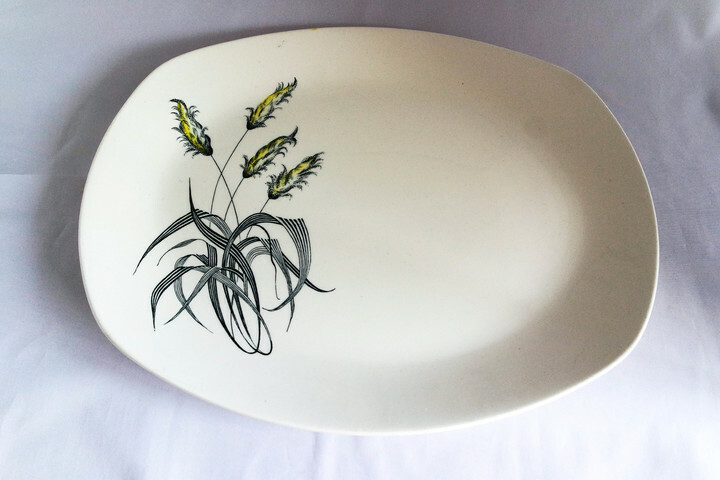 A beautiful Midwinter Stylecraft Bali Hai serving platter designed by John Russell and measuring 352mm x 290mm. In good condition with some minor surface wear and damage to glazing from normal use. Stylecraft was introduced in 1953 and was the first of the ‘modern’ Midwinter wares influenced by the shapes and patterns being produced by young designers in California. Stylecraft was "a modern shape that differentiated itself in the market, yet was practical and ‘not too different’". The range was released in February 1953 with ’40 shapes and 36 contemporary patterns’. The plates and other flatware were ‘squared’ with a narrow rim. Bali Hai, by John Russell dates from 1960.